I found this plant (above) in my garden. Is it edible? It looks like a vegetable. The plant is commonly called wild pepper or daun kaduk. Its botanical name is Piper sarmentosum and it is a native plant of Singapore. It thrives under semi-shaded conditions and is commonly planted as a groundcover in outdoor landscapes. Its leaves have a spicy flavour and have been used to wrap snacks. Sliced leaves are added to nasi ulam, a traditional Malay herb rice salad. I found this plant (above) growing in an open-air carpark and took some back to repot in a plastic container. The plant is small and looks like it can be grown in a terrarium. The diameter of the pot is about 7cm. What is the name of this plant? The plant is botanically known as Erigeron bellioides and its common name is Bellorita. While it is tempting to use this plant in an enclosed terrarium, the plant may not do well due to the lack of light and high humidity. This plant grows naturally in open areas where sunlight is plentiful. The glass terrarium can scatter light, reducing the amount that can reach the plant for photosynthesis. The plant may, however, be more suited to an open container garden situated in an area where it can get at least six hours of direct sunlight daily. I would like to regrow this plant (above). Can it still be regrown a month after it has shed all its leaves? What is the name of this plant and how can I help it to regrow? 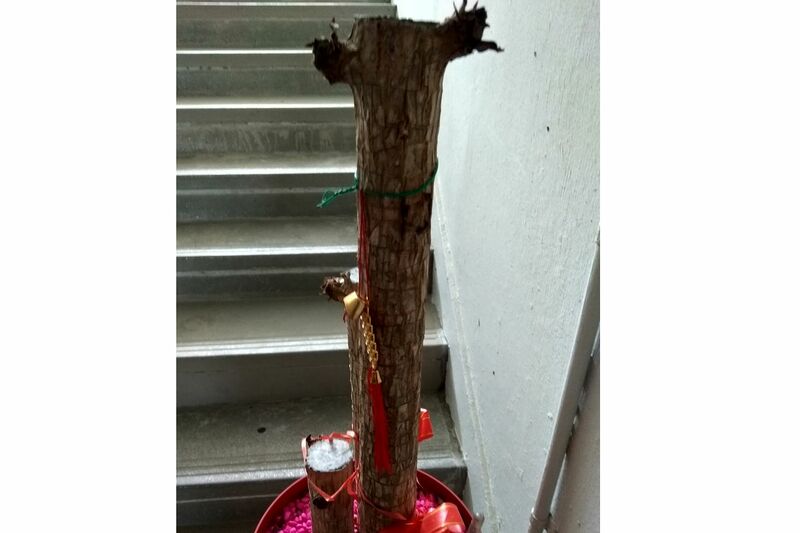 The shedding of leaves of your "Tie Shu" (its botanical name is Dracaena fragrans) may be due to disease caused by the lack of sunlight, lack of water or an overly wet root zone. Whether the plant can be revived will depend on how advanced the disease is. First, cut the top of the stem to see if the plant is still alive and healthy. A dead or unhealthy stem will be dry or black on the inside. If the stem is still alive and healthy, you need to check the roots to see if they are healthy and alive too. Take the plant out from its pot and inspect its roots. Healthy roots will appear white and firm, while dead and unhealthy ones will appear black, mushy and empty on the inside. If only part of the stem is healthy, you can cut the stem until you reach the healthy portion. Cut the bottom part of the stem to remove an unhealthy or dead root system. What you get now as a result is a stem-cutting, which you can plant in fresh potting mix that is kept moist at all times. Keep the stem-cutting in a location that has some filtered sunshine. Once new roots are produced, new growth will appear at the top of the stem. Ensure your Tie Shu is placed in a location that receives at least four hours of filtered sunshine for optimal growth of the plant. 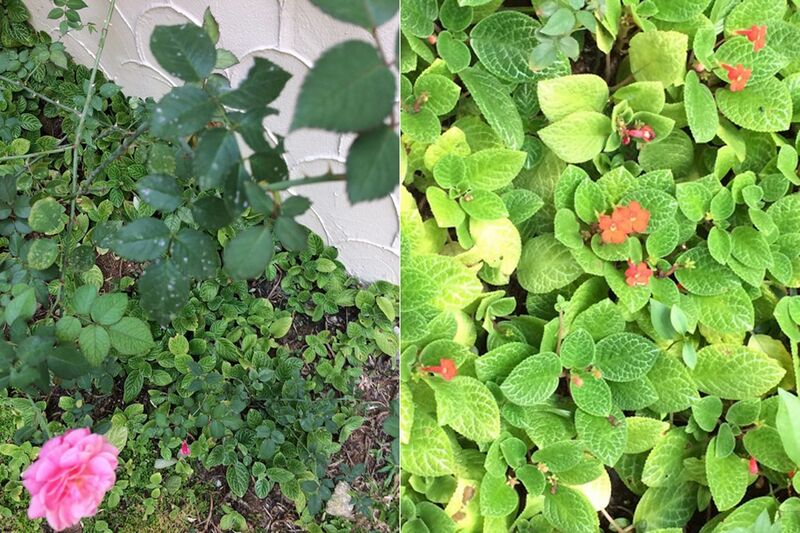 There are white spots on the leaves of my rose plant (above left). Also, why do some of the leaves of the episcia (above right) become light green or yellowish? I have not applied liquid fertiliser for some time. Can these leaves become healthy and green again? Your rose plant appears to be infected by powdery mildew, a fungal disease. Affected leaves need to be removed to contain the spread. The disease can be prevented by applying fungicides, such as chemical ones like captan, which are available from most nurseries. As for your Flame Violet (episcia), you may want to check if it has been sunburnt much earlier on - this can be seen through the yellowing on the older leaves. The plant is a shade-loving species and susceptible to burning by direct sunlight. The damaged leaves cannot be restored to look healthy, but will be replaced by new growth over time. How do I maintain this plant (above) so that the leaves do not dry easily and fall off? Does the plant require direct sunlight? 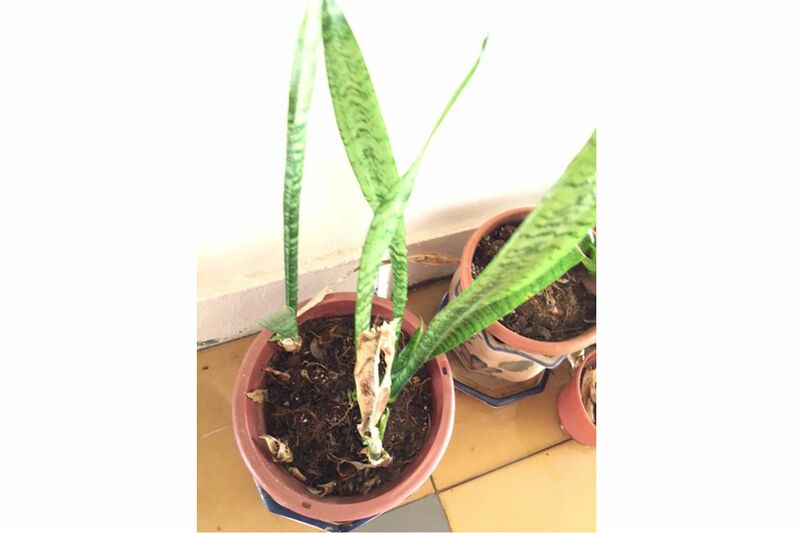 The plant is commonly called Snakeskin Plant or Mother-in-Law's Tongue (botanical name - Sansevieria trifasciata). The plant seems to haveonly a few remaining leaves and this condition is typical of plants grown in a dim location. Although the plant is often said to be a shade-tolerant one, it performs better if it is exposed to at least four hours of filtered sunlight daily. It can be adapted to grow under direct sunlight. The soilneeds to be well-drained. After watering, it should be allowed to dry out a little before the next watering. Prolonged wet feet will lead to rot. Excessive dryness will also cause the plant to decline.